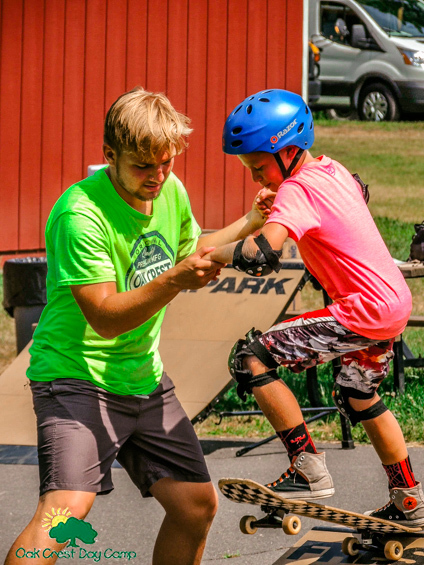 The Oak Crest Program is driven by our philosophy of success and our mission: to create a Summer Experience for our families so exceptional that it makes campers for life! At Oak Crest, we offer programs for children ages 3-15. Each program is designed to meet the physical and developmental needs of that specific age group. All of our programs include hot lunch, door-to-door transportation, and instructional swim lessons. Campers arrive at Oak Crest between 8:30am and 8:45am, and leave at 4:10pm daily. We offer a 5 full-day program for all campers, as well as a 3 full-day and 5 half-day options for campers ages 3-5. Campers are organized into groups based on the grade they are entering in the following September and led by our carefully screened counselors. Groups of similar age are organized into Divisions, supervised by adult Division Heads. Follow the links below to learn more about each of our programs.